You may have noticed that there wasn’t a results post for this challenge. Well, that’s because I didn’t really have any results to post. It wasn’t for a lack of trying though. I looked for a fun trench coat in many, many stores when I was in Toronto and just couldn’t find anything that either fit into my $40 budget or that I liked enough to buy. I continued looking when I got home but still no luck (FYI the Spring coats in the outwear section at Winners are pretty pathetic at the moment). That doesn’t mean that I didn’t find anything of course. 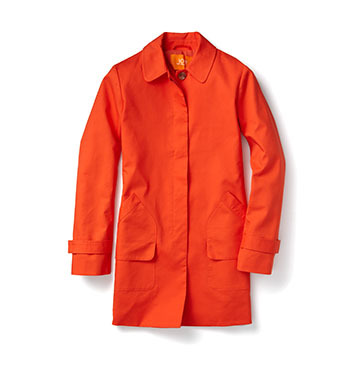 I did find an affordable Joe Fresh trench coat that came in both bright orange or a royal-ish blue but the orange made my complexion look like I was either jaundiced or a long-lost Jersey Shore cast mate (I’m not sure which is worse) and the blue coat was too dark for my liking. So for now I’m going to hold onto my $40 until I find something that I really like. Hopefully I can find something in the next few weeks before it gets too warm to need a coat… thinking that coat-free weather is only weeks away is probably wishful thinking though! Stay tuned for a new challenge this Sunday. I’m also going to try to start going through my backlog of Triumph or Tacky? posts so I have a lot of writing ahead of me!